I'm usually would see flooding in Shockoe Bottom, no report of that happening lately, noew it always Battery Park. And I didn't hear anything about it flooding until Gaston hit and flooded a lot of the area. But the what about on the southside at Midlothian and german school house road, why does those that flood and no one ever does anything about it. I remember back in gaston it flooded up almost all of Midlothian. The city needs to get a handle on flooding. A little thunderstorm or Nor'Easter shouldn't flood up a park past the rim and then flood the entire neighborhood in 4ft of water. The city needs to fix this problem. JWCJ, how old are you?! Do you read the paper or watch the news, or do a little historical research? The areas you're talking about, we already know the causes and they are or have been addressed. Battery Park is flooding now because of a broken sewer line that is nearly 100 years old. 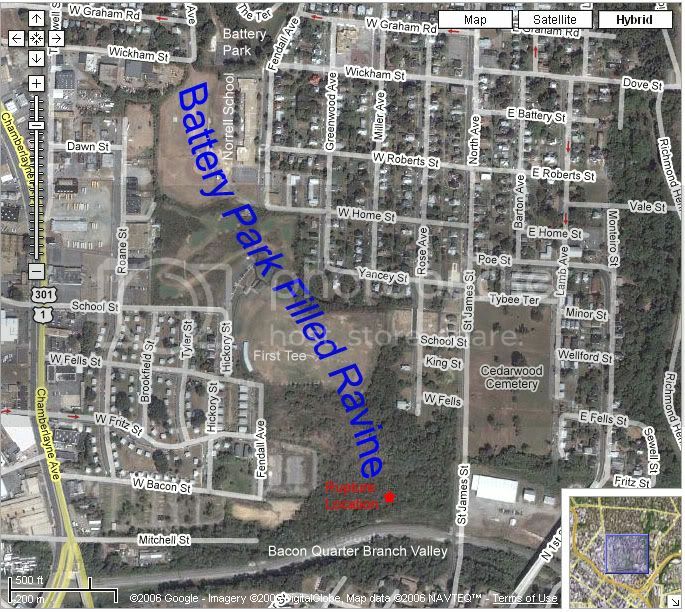 The ruptured portion is under a former landfill that filled up the ravine that used to drain northside by Battery Park Creek into Bacon Quarter Branch. Since the line is buried under 90 feet of landfill, it is hard just to fix the problem and it is underway. So with the line being broken, the water does not go anywhere and since the landfill at the southern end of the ravine acts as a dam, the water has nowhere to go but to fill up the basin that's left. The neighborhoods around the park are not in a flood zone, but as long as there is heavy rain and a blocked ravine, water will fill the park. The pumps are working but they are no match for the rate of this rainfall. It floods at German School Rd and Midlothian Tnpk because of Reedy Creek. The creek has caused flooding problems for years and it is now in a concrete channel which is supposed to help control flooding. However, too the area is urbanized and paved over so the runoff is too much for the channel to handle. With any heavy rain, you will have flooding of roads and neighborhoods. The National Weather Service will issue a Flood Watch and Flash Flood Warnings to alert people of possible or occurring flooding. It's not just an urban problem either. I know that, It's never been that bad there. I use to live out there 3 years ago. It's never ever in my recorded history gone out of the valley and flooding the neighborhood like it's done so in the past few years. The city really needs to fix it's sewer problem. I see where you say it ruptured at. I've been at that area. It's like a clif. I don't understand why it did flow towards the edge. But it's good that it did or Shockoe Bottom would have got flooded again. I'm sure the residents of Battery Park are ecstatic that the Bottom remained mostly dry. Of course their not, but if it went towards the bottom it would be more damage and more of a chance of cost of life. It would be a flashflood not you watching water come out of a valley. You think there aren't sewers along the way? Remember the water is not just rain water, it's sewer water too. I doubt the rains would have flooded anything normally.